Carl “Bud” Street, age 85, of Rockton passed away September 14, 2018, in his home surrounded by his family. Carl was born April 24, 1933 in Chicago, Illinois. He graduated from Robert T. Lindblom High School in Chicago and received his Bachelor’s and Master’s degree in Education from Northern Illinois University. He was a member of Epsilon Pi Tau International Honor Society and Theta Alpha Phi National Honorary Dramatic Fraternity. Carl served as a private in the Army with the majority of his time spent in Korea. 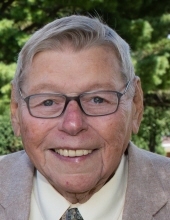 For 33 years, Carl was an industrial arts teacher and vocational director at Hononegah High School teaching thousands of students in woodworking, graphic arts and other vocational skills. For several years he designed and built the sets for the high school’s theatrical productions. Carl was an excellent craftsman having built much of the furniture in his children’s homes. He loved to fish at “the lake” in Wisconsin, always had a book and a gimlet in hand, and was a lifelong Packer fan. He enjoyed travelling on several cruises, bus trips, class trips and family vacations from coast to coast throughout his life. He was a life member of the Rockton Lions Club. Carl was a loving husband, father, grandfather, great grandfather, friend and mentor to many in the community. Carl is survived by his wife, Marlene, of nearly 58 years; his children Robert (Donna) Street, Carol Heck and William (Candace) Street; grandchildren Jason (Megan) Street, Jaime Street, Jena Heck, Davis Heck, India Street and Carley Street; great granddaughter Lily Mayton; sister Katherine Axelrod and several nieces and nephews. Carl was predeceased by his mother, Eleanor Street and his dog Cindy. A Funeral Ceremony will be held at 10:30 a.m. Saturday September 22, 2018 at Old Stone Church 101 E. Union Street Rockton, IL with Reverend Bob Saunders officiating. Burial will be in Rockton Township Cemetery. Reception will be held at the Rockton American Legion 221 W. Main St. Rockton immediately following the funeral. A visitation will be held at McCorkle Funeral Home – Rockton Chapel 767 N. Blackhawk Blvd. Rockton, IL from 4:00 pm to 8:00 pm Friday September 21. To send flowers or a remembrance gift to the family of Carl Street, please visit our Tribute Store. "Email Address" would like to share the life celebration of Carl Street. Click on the "link" to go to share a favorite memory or leave a condolence message for the family.